This puzzle’s got 82 words, four more than the standard max for a themed puzzle. Every Across answer, 3 to 7 letters each, is thematic—each one is the missing word from a phrase that has a familiar abbreviation. So [I*S] clues REVENUE, the Internal Revenue Service, and [USN*] clues the United States Naval ACADEMY. Some of those Acrosses were awkward. SAVE was linked to SOS, which is not actually an abbreviation; the “save our souls”/”save our ship” thing is merely folk etymology. (Folk etymology is basically the urban legends of lexicography.) [AA*P] clues RETIRED, which may irk the folks at AARP who proclaim that AARP is no longer an abbreviation. And then there’s the double use of USPS for POSTAL and STATES, when it would have been quite simple to go with something like [U*A] ( though maybe the “of” is a hitch?). Now, when you include 37 thematic answers, guess what happens to the rest of the fill. Yes, that’s right! You get a little GRIG LUANA TER and some plural RAULS and DRATS. And on a Tuesday! The Acrosses likely pulled many solvers past the tough Downs, but yeah, I could see newer solvers wanting to tear their hair out. 1d. [Small eel], GRIG? 6d. [Actress Patten or Anders], LUANA?? Blech. I also suspect a number of solvers were turned off by the extended cluing gimmick. 3.25 stars from me. No idea why this wasn’t scheduled for a Wednesday or, with tougher Down clues, a Thursday. Not only does today’s puzzle not have a reveal within the grid, it doesn’t always tip us off to the tricky clues by including a question mark. So again: hands up for reading [Clean clothes] as an [adjective noun] construction before understanding that, no, it’s a [verb noun] construct: WASH. Fooled me for a while! To conclude with a most subjective “loved this,” am gonna give a shout out to the [Winter solstice mo. ]/DEC pair. Why do I celebrate a three-letter entry and an abbreviation at that? Because of that clue. Because with the winter solstice, the days start to get longer. And darned if we don’t have daylight AT FIVE and for nearly half an hour thereafter these days. There may be a fresh accumulation of snow on the ground and slush in the streets—and as the Washington Post reports, Punxsutawney Phil may have seen his shadow yesterday—but if the days are visibly longer, can spring really be that far away? Good morning, everyone! First thought I had as I woke up today: I don’t want to go out. AT ALL! If you’re at a warm(er) weather place, just know that I’m jealous of you at the moment. Either in warmth or in freezing conditions, there’s never a bad time to do a crossword, and in today’s grid, offered up to us by Mr. Randall J. Hartman, each of the three theme answers start with the letters M-U and end with the letter D. Don’t be a stick in the mud, people! In terms of underrated annoying pitch people, I think the SCOTTS Scottish pitchman who always ended the commercials with, “Feed your lawn…feed it!” is right up there on my list (30D: [Fertilizer with the tagline “Feed your lawn”]). We have the intersection of ELBA (66A: [Island off Tuscany]) and ALBA in the grid, which I didn’t notice until just looking at the completed grid over just now (59D: [Actress Jessica]). Does anyone else get Jessica Alba and Jessica Biel mixed up, like I do? Some of the down entries were pretty fun, including DUNCE CAP (5D: [Accessory for one who’s been cornered?]) and CABLE CAR (9D: [Ride in the City by the Bay]). Funny enough, I was randomly looking up a whole lot of prefixes and its meaning/origin not too long ago (I lead an exciting life, I know), and just learned about “oneiro,” which made DREAM much easier than it would have been a month ago if I saw that clue (29D: Oneirophobe’s fear]). Man, that would such to be afraid of dreams, wouldn’t it? Yes, any clinical fear wouldn’t be fun, but still! “Sports will make you smarter” moment of the day: FLEUR-DE-LYS (3D: [Emblem of French kings]) – Not only is it the emblem of French kings, it’s also the logo of the New Orleans Saints professional football team. The emblem has been in use since the team’s inception in 1967. 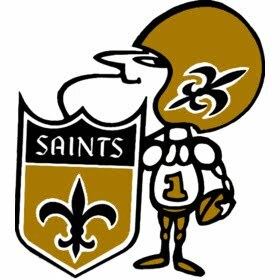 This gives me an opportunity to show you one of the Saints’ first logos, which features a mascot, Sir Saint, that looks like it came out of a Rocky and Bullwinkle or Dudley Do-Right cartoon. He definitely has Dudley Do-Right’s jaw! 17a. [400 athletes? ], CD PLAYERS. 26a. [40 polos? ], XL SHIRTS. 40a. [4 tire inserts? ], IV TUBES. 51a. [600 stand-ups? ], DC COMICS. Ooh, really nice. 64a. [1,500 thermometer units? ], MD DEGREES. “Degrees” often does follow a number, so this one has another level of aptness. 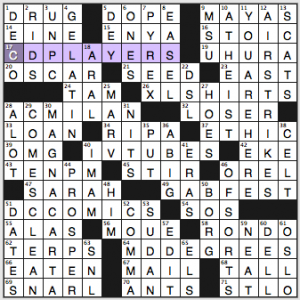 It might be mildly confusing for some solvers that there are four 10-letter Down answers, all longer than the five Across theme answers. Our eyes are trained to scope out the longest fill when taking the lay of the thematic land. But the Arabic numerals and question marks do make it pretty clear which things are theme answers. Lots of lively fill here, too—AC MILAN, COMES CLEAN, MAGNA CARTA, YOU ARE HERE, AIR STRIKES. There’s a moderate amount of crosswordese-type stuff (ENYA, MOUE, ST LO, ARAL, DEY, OREL), but mostly with straightforward crossings. No Scowl-o-Meter action while I solved. 4.33 stars. A very good Tuesday puzzle. Matt’s theme is a quip this week, and Google suggests that the quip may well be original to Matt: “FELINE DIET / KICKS OFF / KITTY REBELLION./ MUNCH TWO / MICE, UPRISE.” The last four words are a play on “much to my surprise.” I’m not sure about the title—is that a play on “beaucoup” or what? 12d. [“Grand Canyon Suite” composer Ferde ___], GROFE. Needed every single crossing here. 66a. [“___ perpetua” (Idaho’s motto)], ESTO. Vermont has an English-language state motto, but some kid has convinced his legislator to push for Vermont to add an official Latin motto. I wonder if that kid has any idea how often Latin mottoes make it into crosswords. 50d. [Key using all the black keys, for short], B MAJ. I never, ever like clues and answers like this. You musical types may disagree. 10d. [Like berries and oysters], SEASONAL. Please! Please do not sully my sweet berries by linking them to slimy ol’ oysters. 41d. [Excuse given by those who hire artists and pay nothing], EXPOSURE. A great many writers are also “offered” “opportunities” to write for free. I still haven’t heard of anyone launching a prosperous writing career by first getting unpaid “exposure” for their name and work via a website or publication that is making money off that unpaid labor. It’s entirely different to build one’s own site and expand one’s name recognition and professional presence. Plural OLEOS is a blight, on toast or in a grid. Not a big fan of any sort of quip/quote puzzles, as the process of work-the-crossings-to-piece-everything-together is less satisfying than the usual back-and-forth workings. 3.5 stars from me. This entry was posted in Daily Puzzles and tagged C.C. Burnikel, Elizabeth C. Gorski, Joe Krozel, Matt Jones, Randall J. Hartman, Zhouqin Burnikel. Bookmark the permalink. Is abbreviation short for acronym? Not a Tuesday puzzle. Genuinely annoying. Not related to today specifically, — but — I give up. . . . What is an FITB clue? OK, thanks Janie — I’m terrible with acronyms, initialisms, abbrs. et al. but a pretty well-informed solver nonetheless! Not particularly annoying but strange for a Tuesday. TER really means three times. I don’t consider it a prefix for “three” ( Just haven’t nitpicked for a while). Well, ternary and… um… Terpsichore.. the muse of three-legged dancers? Amy: I don’t think the “of” matters in this type of theme, like you said in your USA comment. For example, in the clue for “ORDER”, they use the acronym BPOE. BPOE stands for the “Benevolent and Protective Order of Elks”. There’s an “and” and an “of” in there! Also, that’s a very obscure acronym for me. Elks must be in danger. U*A could even be United States Army, or he could have used U*MC or U*AF or U*AA [the insurance company that has been blanketing the airwaves with those “thanks for your service” ads] and so on. USAA actually stands for United Services Automobile Association. I had the same thought as everyone else– not a Tuesday puzzle. In addition to the crosswordese, some of the initialisms are relatively obscure. A neat puzzle though, on its own merits. Joe Krozel channeling George Bredehorn? Very enjoyable puzzle. ‘Folk etymology’ is not urban-legend false etymology. It’s a technical term in linguistics. See the Wikipedia article. Tough for a Tuesday, but wholly original and a bit crazy. Not an easy thing to do. If you’re not solving for speed, finding the initial letters of the Acrosses actually helps to solve much of the ickier fill. So I was a bit kinder to that. I actually forgot the initialism for V*T for a moment, and digging out such things from my brain proved to be rather enjoyable. The bad fill in the NYT was no doubt unavoidable given the theme, and arguably worth it. But the cluing of 20 Down was absolutely avoidable and should have been avoided. Already eight of the 68 down clues are drawn from popular culture–perhaps some (LUANA, REECE, RAULS) had to be. But 20 Down didn’t have to have anything to do with Taylor Swift’s lesser-known back catalogue. What about “signs of sorrow”? Or “earring shapes”? Or “lachrymal effusions”? Or “ocularly generated saltwater”? I don’t know; I’m no cruciverbalist–but something else might easily have been done here. As it is, the puzzle seems to go out of its way to be annoying. Or, if we absolutely must have song teardrops–what about Jackie Wilson’s “Lonely Teardrops”? 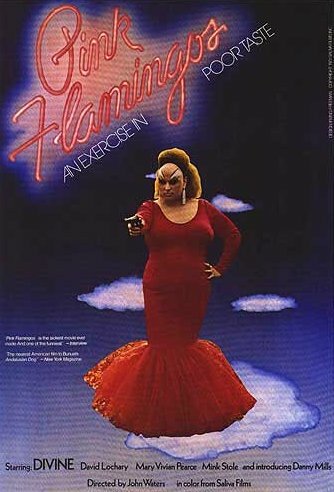 Or Ruth Brown’s “Teardrops from My Eyes”? Or, if we want to be amusingly obscure, “Rain Is the Teardrops of Angels,” by the King Odom Four? This Taylor Swift song isn’t well known, and it isn’t funny. What is it doing here? Why would those titles be better than 20D? I got the answer through acrosses anyway? What is more appropriate about these suggestions? I don’t believe I am the only solver not acquainted with any of them. Unfortunately, it’s in the pop culture mainstram. Although I’m not into her music, I have heard the song very recently piped through a mall store music system. Not the first time, either. And I do not have to go out of my way to hear it, believe me. Do I love the subject song of the clue? No. But to say it’s obscure or not in the main is (or was a couple years ago) just not true. The two LUANAS are perhaps minor pop cultural names from the 1960s-1980s, and not recent (had to look up). I had no idea of either and was less thrilled with that fill. But how are you going to clue that one otherwise? 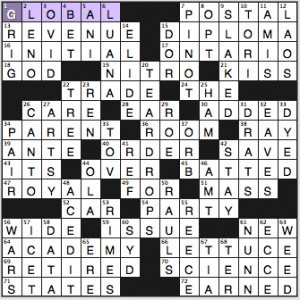 Unlike several other folks, I thought the NYT puzzle was a terrific choice for Tuesday. It was delightfully original and yet ultimately pretty easy. I knew most of the down clues either right away or after I had a little help from those acronyms I knew. 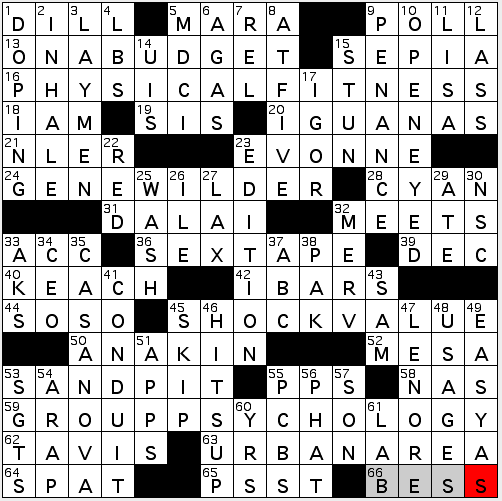 Of course, that’s also how I do most crossword puzzles, filling in what I know, and using that to help me figure out what I don’t know. I might add that popular culture tends to be one of my (many) glaring weaknesses, but I don’t in the least object to TEARDROPS. 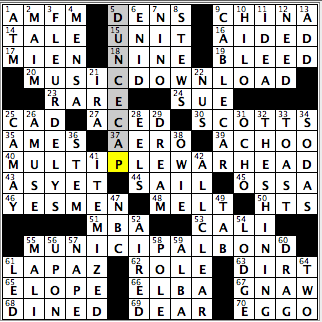 No, I didn’t know the Taylor Swift hit (nor any of the alternative clueings suggested by someone else), but the crossings quickly gave me TEAR, after which I guessed DROPS before even filling in the rest of the crossing acronym words. In short, the puzzle’s originality coupled with what was for me a very rapid solving time made this perhaps the best Tuesday offering I can remember. I’m with you, cyberdiva. 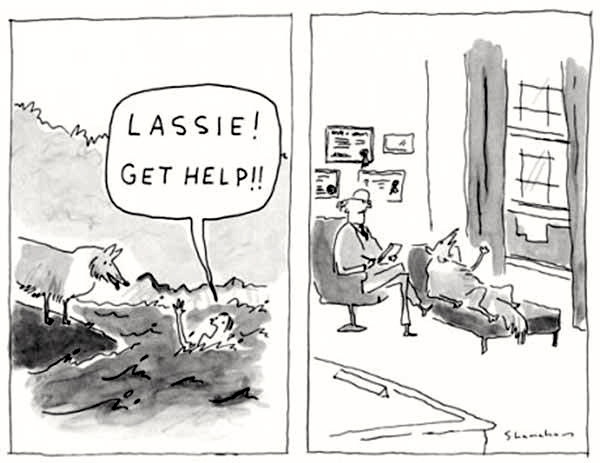 Today’s NYT actully pulled me out of the slump created by the dismal weekend offerings. I was bit sad when I realized that I had come to the end of the puzzle, like finishing a good read. 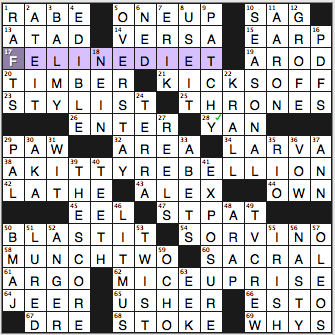 In fact, I reather enjoyed all the puzzles I did this morning, but I thought the NYT was a gem. I loved today’s LAT!! What a great theme!! I did really enjoy the them of today’s NYT based on uniqueness. But I also thought it would be more at home on a Thursday. The NYT theme seemed to be in my wheelhouse – finished in a little less than my typical Tuesday time, as most of the acronyms/initialisms went in without looking at crosses. As a result, I didn’t really notice most of the weak and/or difficult fill while I was solving – but in retrospect, I can see how the puzzle would have been more than Tuesday-difficult for someone who was needing crosses to get the themers. I assume you are referring to the University of Maryland which used to be an ACC team. They are now in the Big Ten. Exactly. The puzzle file at Cruciverb.com was actually replaced partway through the day on Tuesday to correct that clue.